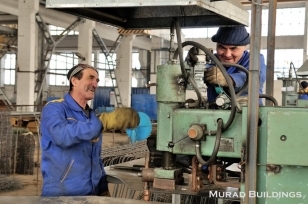 Murad Buildings | News | We congratulate our partners – the vendors of reinforced concrete goods! We congratulate our partners – the vendors of reinforced concrete goods! “BINOKOR” reinforced concentrate products successfully passed through laboratory tests on capacity and core slab floor panel durability. During test all indicators exceeded all regulatory requirements by 170%. Murad Buildings expresses gratefulness for your punctuality, steady quality and reliability! We always choose the best and the most competent partners and consider you company one of them. We wish you success and prosperity of your business and express our willingness always to support and recommend you as the best reinforced concrete goods manufacturer!